I don't think I let you guys know that my satsuki got accepted into the US National Bonsai Exhibition which is in a couple weeks. I thought you might all enjoy seeing the formal display I am sending to the show. I love the kusamono... the tuft of leaves in there is a dwarf form of gaultheria which is rarely used because it doesn't transplant well... but I was fortunate, and its in the same plant family as azalea... which is why I wanted it as a feature in the kusamono. The kusamono is composed of gaultheria, Japanese Blood grass, White Diamond sedum, thyme, and two mosses. One other item of note... The scroll is one of the ones that Paul Goff made for me... I LOVE that man's work. In fact I donated an auction item for the Exhibition of having the opportunity to collaborate with him on a custom mounted scroll. I valued the experiance of working with him so much, I wanted someone else to have that pleasure as well. Plus owning a Paul Goff scroll is just a wonderful thing... and to have it made to ones own specs is very nice. Victrinia - what can I say beyond totally awesome !!! Both backgrounds are wonderful, moving moods from "gray overcast day", or "approaching storm" to "new dawn" or a vast number of other interpretations. While I may be outvoted I seem to prefer the darker one - and how it moves me - it brings out the symbolism offered in the wonderful Paul Goff scroll. The satsuki is gorgeous in its glory and so well matched is your kusamono. I love it. 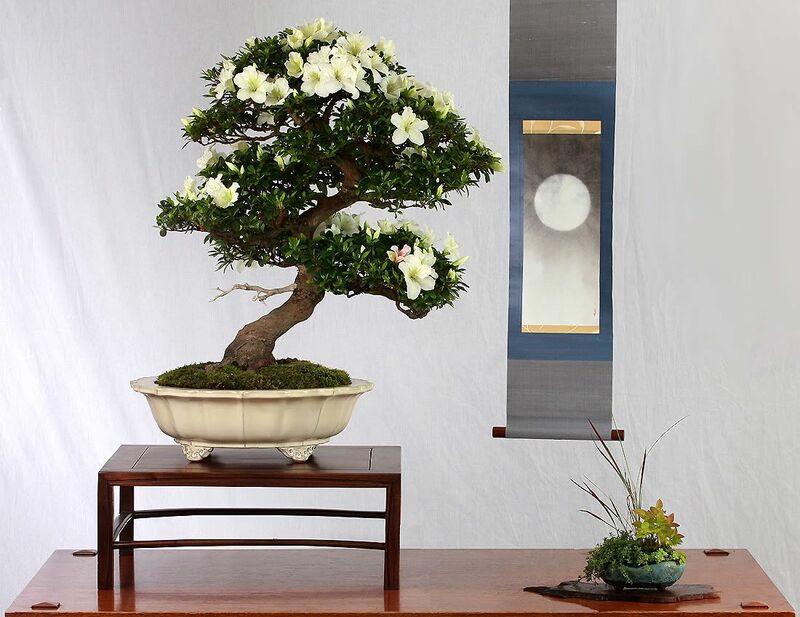 Your display is the first that I will look for at the Exhibit - 2nd U.S. National Bonsai Exhibition in Rochester, NY June 12-13th. I'm so fortunate that it is just a 2 1/2 hr. drive down I-90 for me. Will you be there? I was about to start a thread asking who from this forum will be attending this excellent event and on which days. But this thread will do the same thing. Vic - in case you haven't heard there will be another azalea that we must see at the National Exhibition. It was submitted by Tom Regan who just passed away in recent days, and it has a remarkable story. Tom was a wonderful bonsai artist from Long Island, NY. Many of us first met him at the ABS learning seminars in Saratoga Springs in 2006 when he entered the Joshua Roth New Talent Contest. He was in a special catagory of the competition, not fully qualified, as Tom was quadraplegic and had to work as a team with his nurse. His valiant efforts to create beautiful bonsai were totally awe inspiring. I will never forget that day. I've since learned that he was a driving force in his East Suffolk Bonsai Society, working on their newsletter and web site. 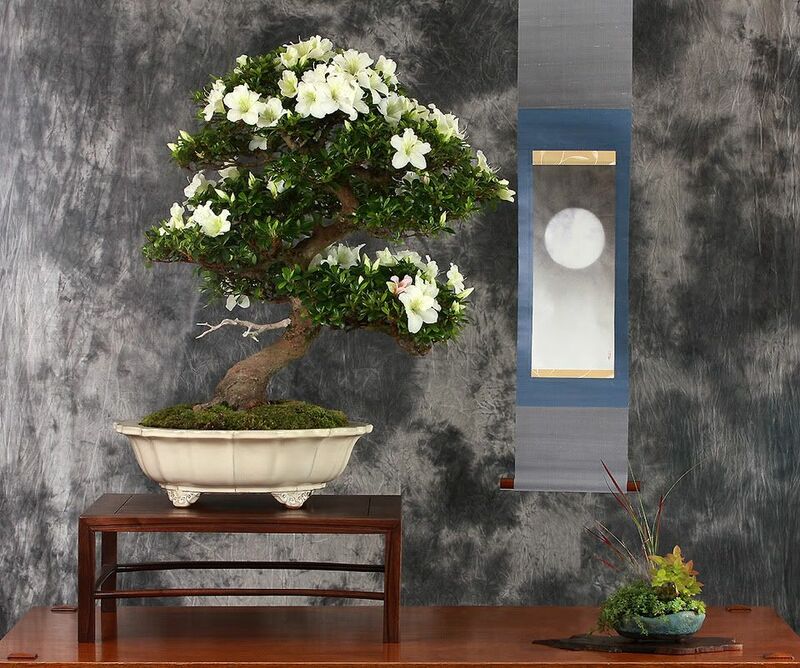 Tom Regan had a dream to have one of his bonsai in the National and this year his azalea was selected. It is being brought to Rochester by his mother & brother. He will always remain an inspiration to all who knew him and all who see his work. However it goes, I'm just happy to have been allowed to participate. It is a very cool thing. I'm all on edge about it. I am so glad you appreciated how dramatically the mood changed with the different backgrounds. I was struck by that as well. The tree will be against whatever backgrounds they have there... most likely it'll be white. But either way, I think she'll show respectably and that's all I can ask. I appreciate the story about Tom... I wish I would have known him... he sounds like he was amazing. Lovely jubbly .. it's a CT wording ..
Congratulations on having your tree chosen for the exhibit. It's a shame that you won't be able to attend. Do you have any concerns about shipping your work off like that? Perhaps it will in the care of a trusted friend. Thanks for showing it to us. Actually the tree is getting taken by refered truck to ny which has been arranged by the Exhibition. Vic - I'm here to tell you your satsuki "stacks up" just fine. The show was IMHO the best I've ever see. There were numerous azaleas - grand, glorious show stopping trees in full bloom. Many were from the Kennett Square Collection and the Montreal Botanical Collection. But yours was right up there. Posted critiques aside I was really thrilled to know this tree was your entry, and I know it was much better than the photo showed. Congrats !! And thank you for sharing it with the very appreciative attendees. PS - Bill Valavanis did a hell of a job putting this exhibit together. And Marco - what can I say? Marco Invernizzi gave the demo of the decade. (my opinion). It was a wonderful day spent in bonsai paradise !!! Naa naa - oops, I'm sorry Vic. I was making reference to the one, by your dear friend, that I saw posted somewhere (like on another forum maybe) !! You will enjoy seeing your tree, and all the others, in the upcoming commemerative show book. I have long contended that the tree is much more interesting in person than in photographs. She has a way of interesting a passer-by and making them want to look at her. I'm so glad you enjoyed it. And yes... my dear friend did have a little fun trying to make a point... but I tried to compensate for the tree's lack of grandure by providing a total image that was pleasing to the eye. Please tell me that your exhibit entry arrived home safe and sound. I think it is quite amazing how the organizers in upstate NY can send climate-controlled vehicles throughout the US to pick up these marvelous trees, safely transport them to Rochester, set up the display and care for them during the show, then return them unharmed back home - without the owners being present. Wow !! As you know many of the trees are real masterpieces. Quite an endeavor and responsibility. Hats off to Bill Valavanis and his entire crew. It should be home tomorrow!!! Satsuki vs. American nursery azalea. Satsuki Azalea - When to Repot? Add Substrate to Soil?